For quick daily inspection of torque wrenches. Suitable for use near the assembly line or at service facility. Easily identify when tools require maintenance or calibration. 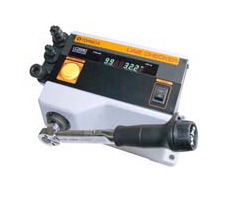 LC20N2-G is available for torque checking for torque drivers. LC1000N2-G is ideal for torque wrench cheking for large tire wheel tightening. Wide measurement range, reasonable price and compact size. The checker has all the features for daily check of torque wrenches on production lines. The built-in clock keeps track of time and date when measurement was taken. Since initial torque is picked up by this checker, over torque of click type, so called, second peak torque, does not affect the reading torque. The internal memory function stores 50 data. The stored data can be easily output by a printer or PC through RS232C. Adapters with combination free heads-hexagon heads can randomly be combined depending on the torque wrench checked. Voltage requirements: AC100V - 240V. Battery pack (Option). LC2-G has all 3 torque units in one model (Newton, Metric and American). LC1000N2 includes two types of socket adapters (no hex adapter) as standard accessories. LC1000N2 includes power supply cable (2m x 2P flat type plug), Fixed board and Eye bolt M12.